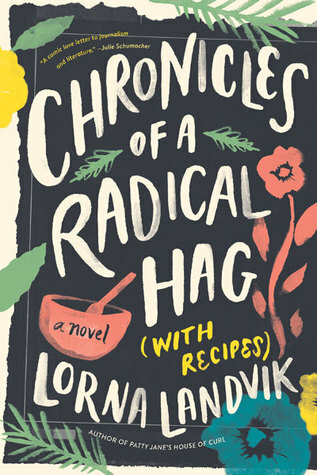 I’ll admit it, I grabbed “Chronicles of a Radical Hag (with Recipes) because of the cover. It was so pretty and the title cracked me up. Also attractive to me was the concept...a woman named Haze takes a job at the local paper and spends decades chronicling local and national events all through the corky lens of her own experiences. Once I dug into it, I had mixed feelings about this book. I thought the tone was old fashioned, which was refreshing, and the characters were likeable enough. But, generally speaking, the plot played out exactly as expected with no satisfying twists or complicated moments. It felt a bit formulaic. I also appreciated that the author had something to say, and saw this book as her opportunity to share her thoughts, but gosh, did I feel like I was in the pew and she was in the pulpit. No need to ask where she stands politically after reading this book! It was as if the columns from Haze were not-even-thinly veiled windows into Landvik’s politics. And if there is one thing I desperately want less of in my life, it is divisive politics, regardless of which side of the divide they fall on. There was very little sign of grace, or interest in conversation, with different people. Ironically, the only character remotely interested in building bridges was its young teenage character, a thrown bone that didn’t make up for the tone of the rest of the book. And what grated the most was that I didn’t really believe the main character, Haze, would have said a lot of the things in the columns attributed to her. She seemed kinder than the words Landvik often assigned to her. In the end, I loved the concept of this book. I love books that celebrate older generations and their stories. I loved seeing significant moments in history through the lens of Haze’s articles. I liked most of the characters and could even get on board with the happily ever after treatment they all received in the end. I just wish there had been more nuance here. Less black and white, a little more meeting in the middle. Grace! We could all use more voices that show grace towards views that are different than our own. University of Minnesota Press provided me with a copy of this book in exchange for a fair and honest review.